Getting Girls Excited About Science | Fem It Up! When I was in elementary and middle school, I loved science. I thought for sure I would grow up to be some sort of a scientist, like a genetic engineer. Well, as luck would have it, I chose to follow my passion for writing instead. But, of course, I don’t regret any of my scientific forays at that young age. I loved participating (and excelling) in science fairs, readings books about outer space and daydreaming about becoming an astronaut. Who knows, it may come true yet. Despite my career choice, I plan to encourage my future daughters to pursue careers in STEM fields. And one way I plan on doing that is sending them to science camps. One of my fondest and most exciting memories from childhood is participating in the B-WISER Science Camp at the College of Wooster in Ohio. My sister and I were invited to attend the camp after our projects won big at a local science fair. We loved it so much that we came back as counselors during college. 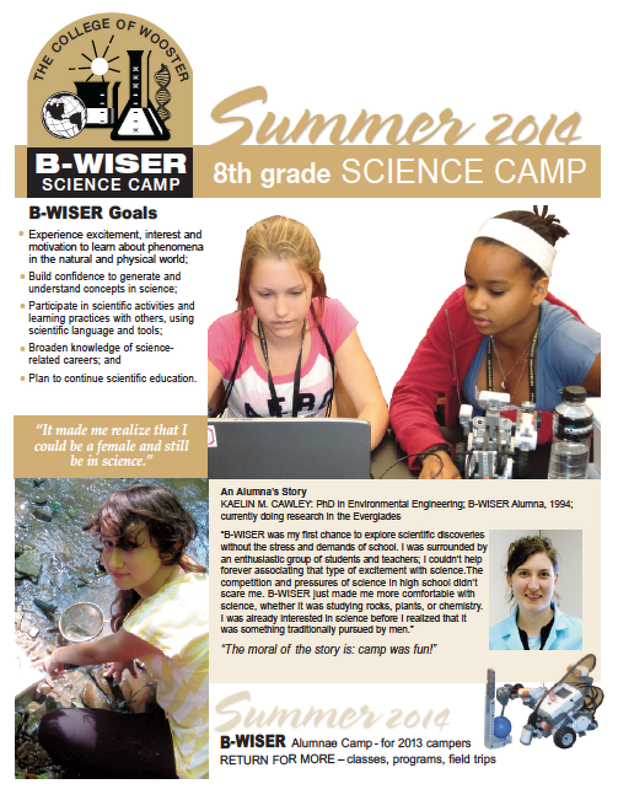 The B-WISER science summer camp’s 2014 flyer. No joke, the camp was a really cool experience. As 12 year olds, it was pretty thrilling to stay in college dorms rooms for a week, spy on the ‘mature’ college kids around campus, and bond with other girls our age. But more importantly, we got to conduct nifty science experiments every day – like measure the stress levels of hamsters and mice and create our own chapstick. The camp’s organizers brought in great guests speakers as well: a gold medal boomerang champion and a physics daredevil who liked blowing things up and even let me lie on a bed of nails. 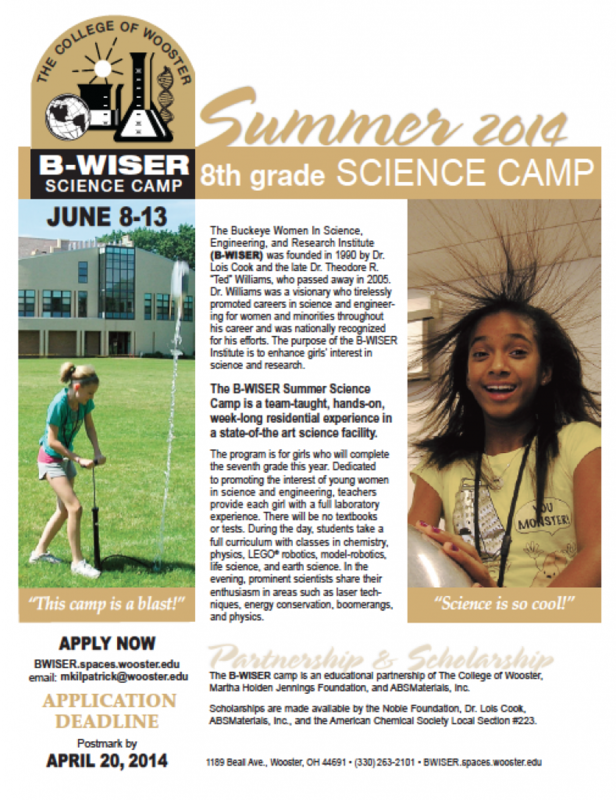 Summer is coming up and I hope parents will consider sending their daughters to a STEM camp. There are many all over the United States. The reason science summers camps are on my mind is because I recently read a really interesting blog post by Care2 about Andrei Linde, one of the developers of the chaotic inflation hypothesis. Linde’s scientific theory is a big deal. Like, Nobel Prize big. But unfortunately, as Care2 explains, there’s a good chance the Nobel Prize committee will, perhaps unintentionally, ignore her contributions. Why? I really hope that doesn’t happen. But there is a precedent for this kind of sexism within the scientific community. Read the whole Care2 blog post to learn more. When I did, I was stunned – no, flabbergasted – by how many female scientists have been robbed of what they deserved. And that is no exaggeration. Moreover, there are so many women scientists we should be learning about in our middle school and high school history/science classes, but we don’t! And that includes Mileva Maric, Einstein’s wife, who many experts say co-wrote the theory of relativity with him! Bet you never learned that in high school, did ya? Feminists have long decried that history has been written from a very phallocentric viewpoint and that women’s contributions have been systematically marginalized in textbooks. After reading the blog posts above, I realize how spot on they are. It’s not that women weren’t smart enough to be scientists in the past, their work was simply ignored! And that is still true today. Women and girls can excel in STEM. But will history and society bother to recognize their contributions? Learn about great women scientists here. Featured image courtesy of Frogmom.